Faith, hope and love. The world needs them and so does art, in good times and in bad, but especially when huge shifts in society and politics mean we don’t know where the road is taking us. Old ways of thinking no longer work. We need to find a new language with which to explore new ideas. There is an urgency for artists to politicise themselves, as human beings. Can art help? The power of art and its social role are the subjects of a roundtable discussion with curator Chus Martínez, artist Michaela Meise and philosopher Dieter Lesage at Spike Berlin titled “A New Language.” Josef Strau talks in an interview with Anna Gritz about Hundertwasser and angels, while, in one of Spike’s “Questions,” Kenny Schachter talks about his love for art even while it is like going to the bathroom. For the other “Questions,” Daniel Baumann delves into the promise of form and Dorothea von Hantelmann explains why art cannot be separated from politics and the market. Other portraits feature Barbara Casavecchia writing on the painter Dorothy Iannone and her connections to Fluxus, Joanna Fiduccia investigating the work of the Japanese artist Tetsumi Kudo and his “philosophy of impotence,” and Dominikus Müller on how art and non-art come together in the work of French artist Marie Angeletti. For the critic Jan Verwoert, who has written this issue’s lead essay, a key function of art is that it teaches forms of conduct. In “Exhibition Histories”, Angela Bulloch talks to Spike about the student show that heralded the rise of the YBA generation: “Freeze” in 1988 in London. In Anne Ellegood‘s “Curator’s Key” she remembers meeting masochist artist Bob Flanagan in his 1994 installation Visiting Hours at the New Museum in New York. For “Artist’s Favourites,” Polish artist Grzegorz Kowalski recalls his teacher Oskar Hansen’s concept of the Open Form and its lasting legacy in following generations of artists. In the “Views,” Andrew Berardini writes a laudatio for Jimmie Durham‘s retrospective at the Hammer Museum. Other shows that writers give their takes on are Steve DiBenedetto at Cherry and Martin and Danny McDonald at House of Gaga in Los Angeles; Inventing Downtown at the Grey Art Gallery, Duane Linklater at 80WSE, and Jackson Mac Low at the Drawing Center in New York; Mahmoud Bakhshi at Narrative Projects and Hamishi Farah and Aria Dean at Arcadia Missa in London; Megan Rooney at Freymond-Guth Fine Arts and Michael Krebber at Kunsthalle Bern, both in Switzerland. In Berlin Adam Pendleton talks about his work on view at KW Institute for Contemporary Art, while critics take on Metahaven at Transmediale, Chloe Piene at Barbara Thumm and Navid Nuur at Max Hetzler, while in Hamburg the show of the moment is Daiga Grantina at the Kunstverein. Allan Sekula features at TBA21 in Vienna, along with Joëlle Tuerlinckx at Galerie nächst St. Stephan, Babette Mangolte at the Kunsthalle Wien, and Nils Alix-Tabeling and Barbara Kapusta at the newly founded gallery Gianni Manhattan. Plus an image portfolio with contributions from Nina Könnemann, Michael Hakimi, Talia Chetrit, Min Yoon, and Mitchell Syrop. 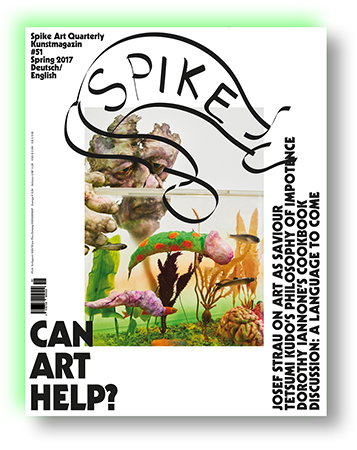 The next issue of Spike will be out in time for Art Basel, released on June 6.